Awareness of one of the gravest—yet little known—mass atrocities taking place in the world came to Minnesota recently, after the state senate put up for vote, and passed, a resolution condemning the organ harvesting of Falun Gong practitioners in China. “Who could not accept that?” she added. Sen. Johnson went on to introduce the core of the bill: this is that practitioners of the Falun Gong discipline have been killed for their organs in China, by the state, for over a decade. Falun Gong, a system of five meditative exercises and spiritual teachings which is taught and practiced freely, became extremely popular in China during the 1990s, and had even earned the support of the state. By the end of the decade, however, it had attracted more practitioners than were members of the Communist Party, and hardliners in the regime—including then-Party leader Jiang Zemin—decided to launch a comprehensive campaign of suppression to eliminate the practice. Violence was one of the key tools used to effect this. It soon became clear, however, that the bodies of the targeted population were worth more dead than alive. 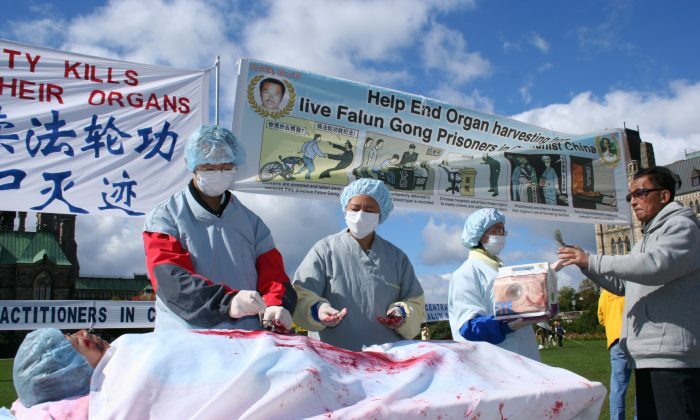 Since 2006, a large and growing body of research and evidence has indicated that practitioners of Falun Gong have been killed, in large numbers, for their internal organs, which are sold to Chinese and paying foreigners. “The Communist Party of China does not want the world to know of its human rights abuses,” Sen. Johnson said. Researchers have published books, independent reports and scholarly studies have been written, and detailed pieces of investigative journalism have been published, attesting to this grim industry. The documentary “Human Harvest,” treating the issue, received two major industry awards last year. This newspaper has also been recognized for its work on the subject. Doctors Against Forced Organ Harvesting, a medical advocacy and research network based in Washington, D.C., recently estimated that the death toll from organ harvesting could have reached into the hundreds of thousands. The Chinese authorities have never provided an explanation for the vast number of organ transplants performed in hospitals across the country. They’ve opted to engage in propaganda and sniping, instead. Sen. Johnson explained how she soon became a witness to that process. Minnesota Senator Alice Johnson spoke at the house floor vote. After introducing the resolution in April 2015, along with Rep. Phyllis Kahn, she received a letter from the Chinese consulate in Chicago. Epoch Times obtained copies of the letters dated April 2015 and March 2016 both of which were identical. They “express deep concerns” over drafts of the bill. The majority of the letter consists of the same kinds of slander against Falun Gong as feature in state-run media in China, however. Senator Dan Hall, who also spoke on May 20, encouraged his colleagues to support the bill. Hall said he was also the subject of a surprise visit by a Chinese delegation—including the Deputy Consul General in Chicago. “It is not often that the official liaisons of a foreign power visit with, or care about the actions of, a Minnesota state legislator. So, when I received the Chinese Consul General’s meeting request, I confess I was surprised,” he wrote in a newsletter to his constituents. He appeared disappointed when it became apparent that the complaints lacked much substance, however. The delegation merely denied the persecution, said they “resent” the allegations, and went on to attack Falun Gong. “We have enough people that give enough evidence that these things are going on and we need to stop it,” Sen. Hall said on May 20. Other senators appeared to agree. The bill was passed 52 for and 0 against.